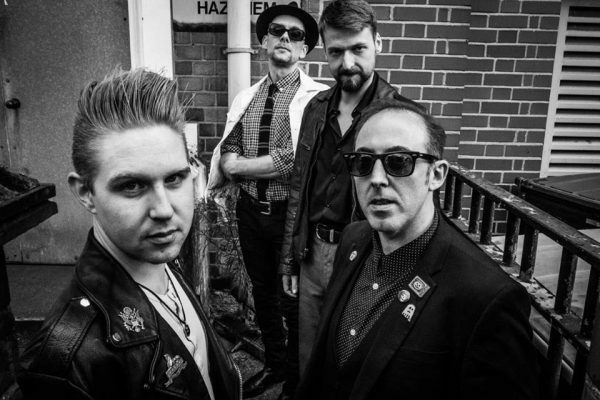 South London garage types THE SLY PERSUADERS have their long-awaited debut album out this week, and they’re unveiling the lead-off video exclusively with Vive Le Rock! ‘Watch & Learn’ is taken from the self-titled album, which is released through Roadkill Records on Friday 24 February. Forging a strong following on the London circuit, the band drew on the dark psychotic rockabilly forces of the likes of The Cramps, The Gun Club and The Bad Seeds for the album, which was recorded at the Music Complex in Deptford. The video is the work of filmmaker Stacy Picard of Massive Capital Video, who says, “The Sly Persuaders are a master class in controlled chaos, always teetering on the verge of total collapse so I set out to make a video that looks like they sound, bad acid. The shoot itself was a truly alcoholic affair and I could have cut an entire second video comprised of Chris ‘fixing’ his hair, there was enough footage. Good lads, bad habits. The real challenge was making them look charismatic and attractive thus all the special effects. The Sly Persuaders will launch the album on Friday 24 February at a special Roadkill/Some Weird Sin night at Nambucca in Holloway, in the company of SAINT AGNES and BRIDPORT DAGGER. Tickets are available here, but they’re going fast! The Sly Persuaders is available to pre-order on vinyl and download here. ‹ CUT ANNOUNCE ALBUM AND DATES!